Ye Yongqing is Chinese artist, born in 1958 in Kunming. He got his education at Sichuan Academy of Fine Arts, where he studied at the Oil Painting department, and graduated in 1982. Later, he started working there as a professor. A good part of his career Ye painted portraits of birds, with jagged, clever lines, focusing in recent years on the creation of colorful collages. Through his distinctive stroke, his birds aim to incorporate mythologies from all over the world. His distinctive style could be said that is both traditional and new. Made in a sweeping gesture, series of paradoxical structures curve the frames of birds depicting both stillness and movement. They are both simple and complex, elegant yet rough, controlled yet whimsical, substantial yet skeletal. About his painting, Ye said: “Scribble usually gives an impression of fast and simple. But if I sketch something childish in a mature way and with slow process, people might miss-recognize it as a child’s drawing at first, then suddenly discovering the meaning in it. This is an interesting process that I am like a trap setter, making a joke to visitors just for a harmless fun.” Painting birds he earned his nickname Birdman, while others call him Chief Ye, because of his influence in the Chinese art world. He is also an art director in Contemporary Art Academy of China, and has an equal fame like Zhang Xiao Gang and Wang Guangyi. With them and Mao Xuhui and some other artists, he was a founding member of the Southwestern Art Group which was formed in the mid 1980’s. Ye has always avoided the Scar Art and Social Realism of the previous generation, and even seem to have bypassed the Political Pop that was popular with his contemporaries and gained attention worldwide. From his words can be realized why he never accepted popular artistic practices of his time, and embraced conceptual art before his fellow artists: “The national character has giving us too much boundaries. I was deeply touched by artists without boundaries. They directly express the thoughts with great explosive force to fill the artworks with energy and life.” Ye is one of a large number of artists who have set up studios in city of Dali, the area of the Yunnan province, southwestern China, in recent years. This ancient walled city is located between the rugged Cangshan Mountain and the beautiful Erhai Lake. Decision to move to his mother’s ancestral town he made while living in London, after felling very ill in 2006. “I had a fever over 104 degrees for 13 days,” he said. “My health was wrecked. And I thought—where I can go to recover?” Dali was the place that came to his mind, a place known for its allegiance to its traditions. For his studio, he chose the big, open space of the attic in the house he and his wife bought from a local business man. It has plenty of light, and only a few pieces of furniture, including a couple of tables in the classical Ming style, that hold his containers of brushes. For the past decade he has been best known as a curator, art events organizer, and artist community booster. His work is included in significant museum, corporate, and private art collections in Western Europe, North America, and Asia including the Guggenheim and China Museum of Fine Art. 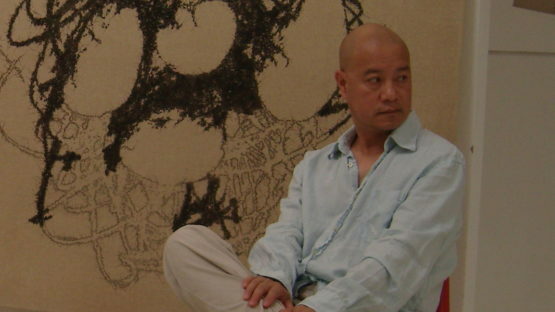 He made a significant contribution to Chinese contemporary art through his work.